Secret internal reports and memos by one of George Soros’s left-wing front groups reveals the socialist billionaire’s subversive reach within the Obama administration, the United Nations, and the governing structures European Union, especially as it relates to the manufactured refugee/migration crisis. Among the many noteworthy points made by Soros activists in one report is the assertion that the migrant/refugee tsunami that has already swamped Europe with 1-2 million Muslim migrants should be accepted as “the new normal.” This is not surprising, but it is alarming. It is not surprising because for many years Soros and his minions have been in the vanguard of the Open Borders/Migration Lobby. It is alarming because the radical “migration rights” agenda of the Soros network is being translated into official policy, nationally and globally. 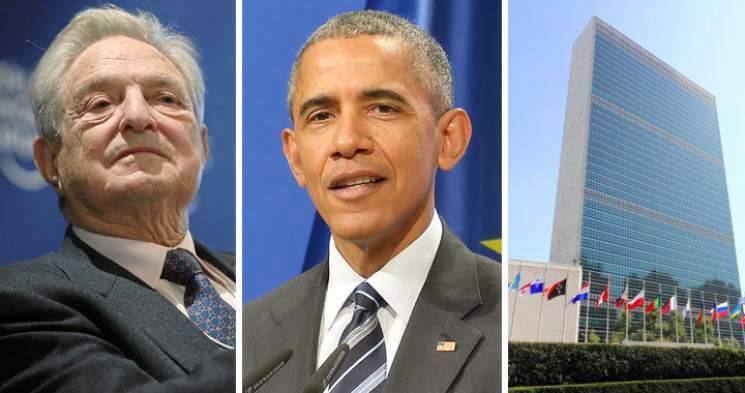 Their report also provides revealing details on the Soros/IMI/OSF relationship to Goldman Sachs titan Peter Sutherland, the UN’s top globalist agent in charge of designing and implementing the UN’s chaos-producing migration programs. When we made the CGPI grant, even we were somewhat skeptical about the appetite for reform of the institutions that govern elements of migration at the international level, and the pace at which it might proceed. Nonetheless, we recognized the importance of starting this discussion, and the political capital Sutherland could leverage to bring high-level attention to the issue. This gamble has arguably paid off: as the September UN and President Obama’s summits on migrants and refugees have taken shape, Sutherland’s team has effectively drawn on work and thinking it had already done to influence the scope and deliverables of these two meetings. IMI’s access to the Sutherland team’s discussions has allowed us to keep civil society partners up-to-date on the latest developments, in order to inform advocacy and campaigning strategies prior to the events and to plan follow up actions. CGPI’s elite-level behind the scenes advocacy through Peter Sutherland, has positioned its team of experts to influence policy and practical follow-up to global events. This has been complemented by MPI’s [Migration Policy Institute’s] neutral voice and ability to generate the policy-relevant research and evidence base needed to shape migration debates. This pairing has worked well and there is a natural collaboration between the experts that both centers engage. First, a few important notes about the above-mentioned Peter Sutherland. While not a household name, he is very well known in the corridors of power, and he is having an impact on almost every household on the planet. As we reported here last October (Insider Peter Sutherland: EU-U.S. Must Take More Refugees, Get Rid of Sovereignty), Peter Sutherland is an insider’s insider; he epitomizes the uber-rich, globalist-corporatist elite. It is worth noting that the Columbia Global Policy Initiative (CGPI), which the Soros report mentions funding and collaborating with, refers to the organization established at Columbia University that has become a leading force for the radical migration agenda. The CGPI is run by Professor Michael Doyle, who, naturally, is a member of the world-government promoting Council on Foreign Relations (CFR). Other prominent CFR members on the CGPI directory include Jeffrey Sachs, Joseph Stiglitz, Carol Gluck, and Lee Bollinger. The Illuminati puppets, George Soros, Peter Sutherland and Angela Merkel are the 3 horses of the European apocalypse causing it´s destruction. They should all be brought before the Criminal Court of Justice for their perpetration of death and destruction to humanity.